Everything on this planet is formed from molecules. Molecules are groupings of specific atoms and they form the matter that we can see (and, by virtue of obviousness, so do atoms). Every molecule oscillates at its own distinct frequency...and each vibrating molecule has a destruction frequency. What I mean is that there is a specific frequency that can destroy a specific molecule. Or, as Dr Rife coined it, the 'mortal oscillatory rate' (MOR). How does a crystal glass break when exposed to a certain frequency of someone's voice? Because the frequency was the exact MOR to destroy the crystal molecular structure. Posted in Alternative Health, Vibrations. 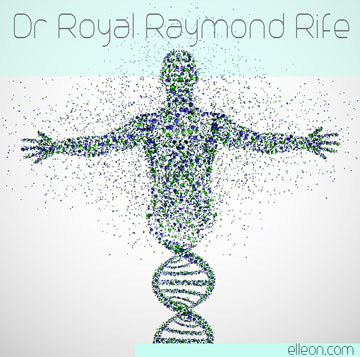 Tags: Royal Ramond Rife on February 16, 2016 by noelle1000.